Every year I have purchased ten queens for new up-river hives. This year I was able to buy the girls from Cold Country Queens in New York State. I particularly wanted queens from this source because they raise Russian Queens and use them in an apiary that, like mine, needs bees that can endure cold weather. I really like Russians (called Primorsky Honeybees anywhere but in the US – go figure). 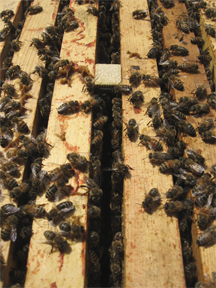 They are resistant to Varroa mites and they do very well in cold climates. They do have a bit of a reputation. They are not the nicest bees in the world, but I’ve never had much of an issue with them, except head banging. I simply wear a veil, which I do anyway, to keep them from getting stuck in my hair. They are said to swarm easily. That’s not been a problem for me. Or one could alternately say, my Russian queens tend to swarm as easily as my New World Carniolan Queens. It’s just down to me to keep up with the bees and anticipate what they’ll do given the honey flows and changes in weather. BeeBehavior has general overview the history of Russian bees. The USDA site, Primorsky Bees, goes a bit further in depth. I installed my new queens in splits and placed them in three of my up-river bee yards. These are in the bee yards in and closest to Brookfield Farm in the foothills of Mt. Baker near the Northfork of the Nooksack River. My aim is to add some new genetics to my area. The queens I raise at the farm are open-mated. As I am pretty much the only beekeeper crazy enough to keep bees up here, my queens mate primarily with drones from my own near-by bee yards and the feral honeybees that have survived up here. (Honeybees have been in and around Maple Falls for nearly 100 years). I place their cages between the top bars in the center of the brood nest with the cage wire facing away from the front of the hive. Why? Because I’ve always done it this way and it works. I figure if someone put me in a box I would not want to face in the direction of the draft. Just a feeling, no studies, no science. The queens spent a week in the hive with their new workers. Seven queens were released by the bees. Three needed a little help: the bees were chewing though the candy, but had not quite opened the tube. 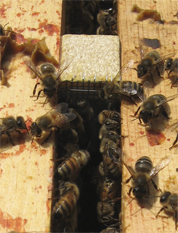 When released, these queens simply walked down into the hive, having been accepted by the worker bees. Now it’s wait and see. As of last peek, they are laying nicely. I’ll just leave them to it for two weeks now. If all goes well, I’ll have some Russian drones flying later in the summer to, hopefully, meet up with the Brookfield Farm queens on their mating flights. That’s all the news from Brookfield Farm Bees And Honey in Maple Falls, Washington. What’s your favorite type of honeybee? Also if anyone is or knows anyone who is raising Apis mellifera mellifera (the little black honeybee) please contact me. I would really love to add these into the genetic mix up here. This entry was posted in Beekeeping and tagged Beekeeping, bees, Brookfield, Brookfield Farm, Farm, honeybee, install, Maple Falls, queens, Russian, Washington. Bookmark the permalink. i am thinking of requeening my sluggish italians from last year, i am in NH and have just received a package of Russians for my second year. my question is for my leftover hive i am thinking to go with a russian queen but will they accept her? how soon should i kill the old italian. the italians are content on staying in the hive eating honey reserves from last year. the new russians are going in and out like crazy collecting pollen and i imagine their queen is already laying, i will go in this weekend to see. they were installed two weeks ago. Introducing Russians can be a bit tricky – they, apparently smell quite different to other subspecies of bees. So three days before I received the Russian queen, I’d go in find the Italian queen and kill her – or trap her and give her to a friend who has a queenless hive (nicer). That way you have three days for the pheramones to disappate a bit and for the bees to realize they’re queenless, but not long enough for them to become laying workers. Then when the Russian queen comes, I would hang her cage (with her in it of course) off the top bars in the center of the brood nest. 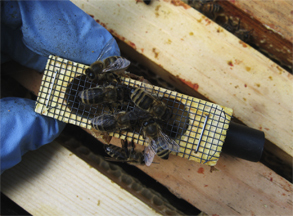 If she has come with enough sugar plug, you can tape over the sugar plug for four days – to let her smell get around the hive. Then remove the tape (not the plug) and let the bees free her. When you first put her in, just hold the cage there for a bit and judge what the Italian’s are doing (are they trying to ball her, sting her, or just check her out). If they seem aggressive, I’d pull her for a day, spray some sugar syrup on her and keep her in a warm room for 24 hours and try again. This has worked for me. I love Russians. Where did you get your queen from? Oh, and I’m sure everyone has told you that you’ve got to stay ahead of Russians – they like to swarm – it’s one of the ways they are resistant to mites. Hope that helps.